The news was updated on April 3, 2019. 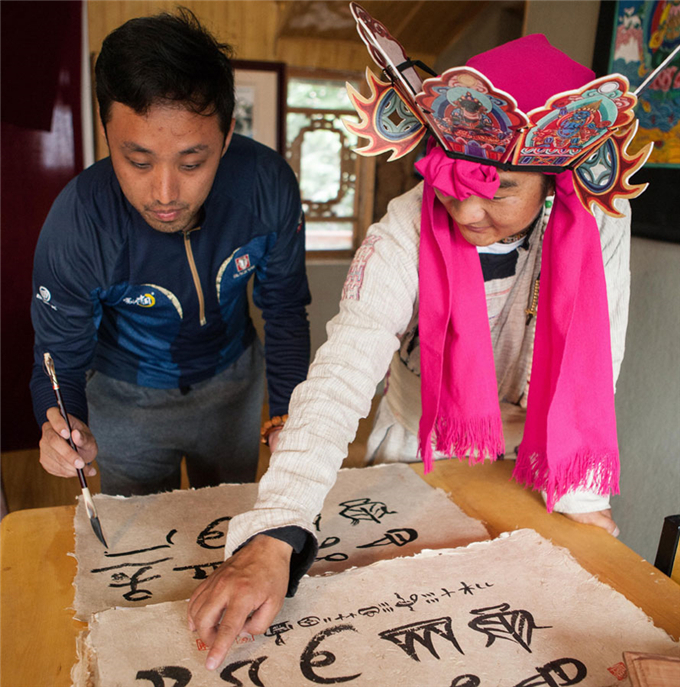 A tour guide of the Naxi ethnic group (right) teaches a tourist how to write Dongba pictographs at a cultural center in Baisha village, Lijiang, Yunnan province. Dressed in traditional Naxi costume of a goatskin vest and a white robe, He guides tourists to learn Naxi scripts, history, culture and tradition at his center of Naxi Dongba pictographs and paintings in the Old Town of Lijiang, Southwest China’s Yunnan province. “Peak seasons such as national holidays, summer and winter vacations see around 5,000 visitors a day,” the 42-year-old said. As a Naxi person, He grew up in the Old Town, a UNESCO World Heritage Site with an 800-year history. The town attracted more than 14 million tourists last year. For about 30 years, He has been learning Naxi painting and pictographs. “With a population of more than 300,000, less than 700 Naxi people understand Dongba pictographs, and only a few can do traditional Naxi paintings,” he said. “I think it’s my responsibility to pass down our culture, which is so vivid and charming, and let more people know about it,” he said, adding that most Naxi people live in Lijiang. “That’s why I came back here after graduation. His devotion to cultural protection is greatly supported by the local government, and they entrusted He to open the experience center in the busiest area of the Old Town in 2016. They give him 400,000 yuan ($59,600) a year for daily maintenance and other expenses. “The local government offered us this two-story cultural courtyard with traditional Naxi characteristics as our center, covering about 300 square meters. We have divided it into several rooms for exhibitions and classrooms,” he said. He and four other Naxi guides work 14 hours a day. By the end of last year, there were 17 free cultural courtyards in the Old Town of Lijiang, including He’s. With the support of the local government, 12 more are expected to open to the public this year. “I think the courtyard is a window to promoting the culture of Lijiang, as well as an important base for visitors to learn and try by themselves to have a more comprehensive understanding of our culture,” he said. He’s experience center has also partnered with travel agencies, summer camps and schools to offer free training classes on Naxi culture, receiving more than 7,000 students each year. “Without the courtyard, nothing would be close to possible,” he said. To prevent the Old Town from becoming too commercialized after years of tourism development, the local government has set up a specialized annual fund of 10 million yuan for its cultural protection. All buildings in the Old Town are required to maintain traditional ethnic characteristics. Dancing halls and internet bars were among those that were inconsistent with the ancient Old Town, and have all been closed. A total of 299 traditional houses and 236 yards have so far been restored and renovated by the local government and the Global Heritage Fund. “We also invite folk artists and culture inheritors to show their skills in the Old Town to attract more tourists. On traditional festivals, we hold grand celebrations in the Old Town,” He Tang said. 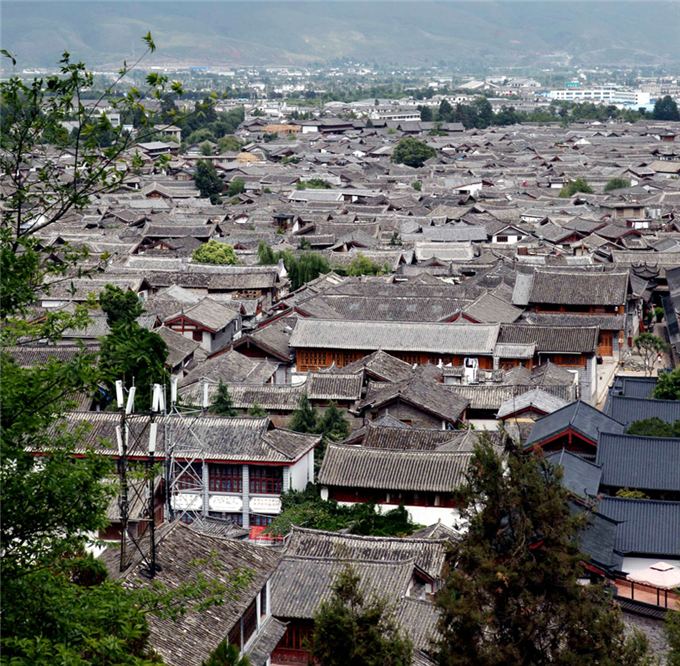 More than 90 sets of books telling stories of Lijiang and the Naxi culture have also been published, the official said.